At the height of the Nazi occupation of Czechoslovakia, four German exiles in Hollywood – director Fritz Lang, playwright Bertolt Brecht (earning his only US credit), composer Hanns Eisler and actor Hans Heinrich von Twardowski – pooled their talents to create Hangmen Also Die!, a remarkable film about the Czech resistance. Twardowski plays Reinhard Heydrich, an SS Obergruppenführer and the ‘Reich-Protector’ of Czechoslovakia, known alternately as ‘The Hangman’ and ‘The Butcher of Prague’. When he is assassinated by a surgeon (played by Brian Donlevy), the city is locked down and the doctor must rely on the help of the resistance to evade capture. Shot by the great James Wong Howe (Sweet Smell of Success, Seconds), Hangmen Also Die! Is a gripping blend of war picture, film noir and political thriller. Last edited by Finch on Mon May 09, 2016 11:59 am, edited 2 times in total. Shocked this didn't come from MOC, but excited to finally pick this one up. matrixschmatrix wrote: 19. 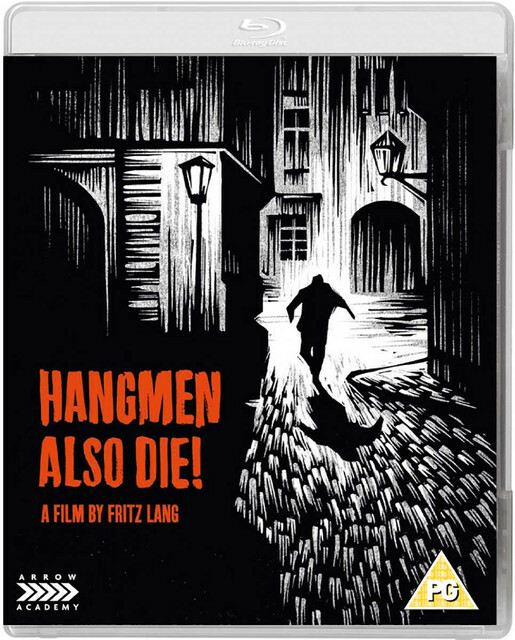 Hangmen Also Die (Fritz Lang, 1943)- I'm hoping this one's because everyone wants a better print than the Kino. It's hard-edged, nasty stuff even with the original ending cut out, and it's a view on the ethics of resistance that I haven't seen elsewhere. colinr0380 wrote: [At first] I had problems with the first half hour or so of the film, which felt rather clunky in a way that I couldn't quite put my finger on (Is it the strange mincing, prancing performance of the German General adding to the comedy of the opening scene? The rather fake-looking sets? The American accents, especially the Brooklyn cabbie and the annoying young boy of the family?) Is this Brechtian alienation, or just clunky set up? However despite taking a while to get going once Miss Novotny goes to the Gestapo and the wheels of justice start turning the film immediately shifts into magnificence as matrix states. I especially liked the way that the Gestapo investigator here trying to solve the case is kind of sympathetic, with a few tics that made me think of the role as similar to the Inspector from M, just with the fascinating inversion that the people he is trying to catch are the Resistance heroes rather than a serial child murderer! While we obviously are given heroes to root for I found that final section of everyone in the town banding together to frame Czaka both ironic (in the sense that even Czaka's butler betrays him!) and perhaps the most frightening example of groupthink in the entire film! What is that old adage about the danger of becoming similar to your enemy in the process of fighting them? matrixschmatrix wrote: I'd agree it takes a while to get to what it's really going for, but I think the first half hour or so is more or less setting the table, giving you a feeling of more-or-less middle class normality even while the Occupation and assassinations are going on- formally it feels much less striking than the rest of the movie, and I think that might be deliberate, as it is with Went the Day Well?. I wonder if the criticism of group action that you saw was something Lang laid over Brecht's script- Lang habitually distrusted any form of organization whatsoever, so I'd believe that he couldn't bring himself to depict something like the Resistance's framing of Czaka without both making Czaka a bit sympathetic (or at least, squirmily human) and making the people acting to destroy him frightening, if also righteous. The movie as a whole feels much more like Lang's work than Brecht's, to me, though it's certainly unafraid to be didactic. matrixschmatrix wrote: It's funny, because that imagery is somewhat in conflict with the other thing I really took away from that movie, the idea of an absolute solidarity amongst occupied people that could overwhelm even Nazi intimidation tactics- which is obviously the more Brechtian part of the movie. It's honest about what such solidarity could actually cost, but bold enough to insist that we accept that resistance is nonetheless the right thing to do- and the existential bleakness of that dilemma is honest to God shocking for a Hollywood movie. colinr0380 wrote: Her acceptance of her father being lost and of her own loss of the isolationist/naive stance (or having it infected by the actions of the Doctor in staying with the family) through coming to terms with that loss is the first step to both her and her family opening up to the wider resistance movement . With that existential bleakness you describe only being underlined by the essential futility, and stoic aknowledgement, of Novotny's attempts to save her father in slightly extended ending - on the individual level her family is torn apart while simultaneously that period of her life has likely only solidified her support of the organisation as kind of a compensation or consolation for that personal loss. Essential Lang, for me. One of his best American films (after THE BIG HEAT). Get it! Lovely! There's a couple of other Cohen releases I wouldn't mind seeing come from Arrow, including the Clement and the Melville. Importing from the US is so expensive right now compared to Europe. Its also interesting to compare the approach taken in this film to Lang's other, US-set, 'mob justice' movie from 1936, Fury. Is there an inherent problem with the source? I noticed a bunch of quick flickers or tiny jumps as if a frame was missing. Or is there a problem with the disc? I saw the exact same little jumps in the supplement.